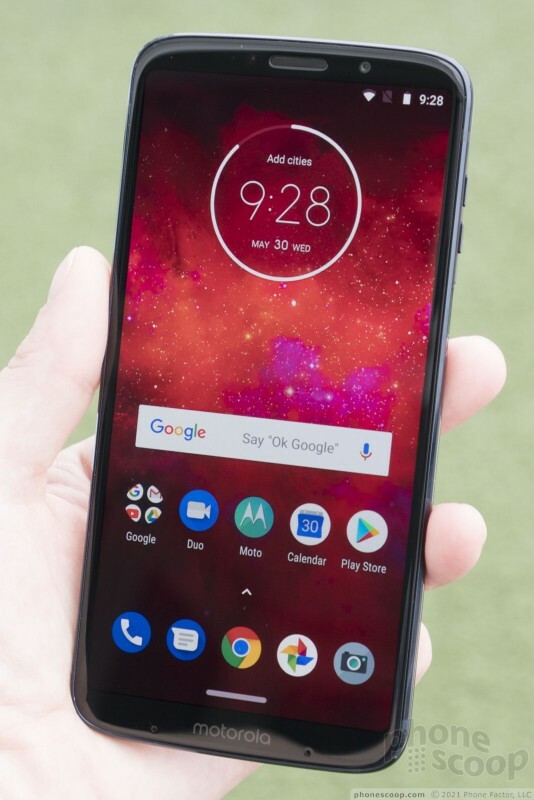 Motorola's third-generation Z3 Play is a capable mid-range device that checks off most features needed on a modern phone. 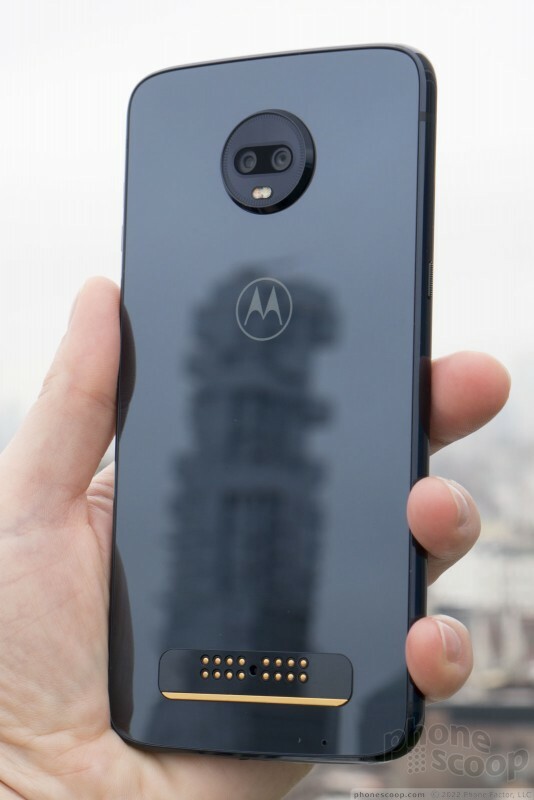 It packs a 6-inch 2:1 screen, a metal-and-glass design, all-day battery life, advanced cameras, and of course compatibility with Motorola's existing Moto Mods accessories. If you're looking to update your Moto Z device, the Z3 Play makes a play for your wallet. Here are Phone Scoop's first impressions. 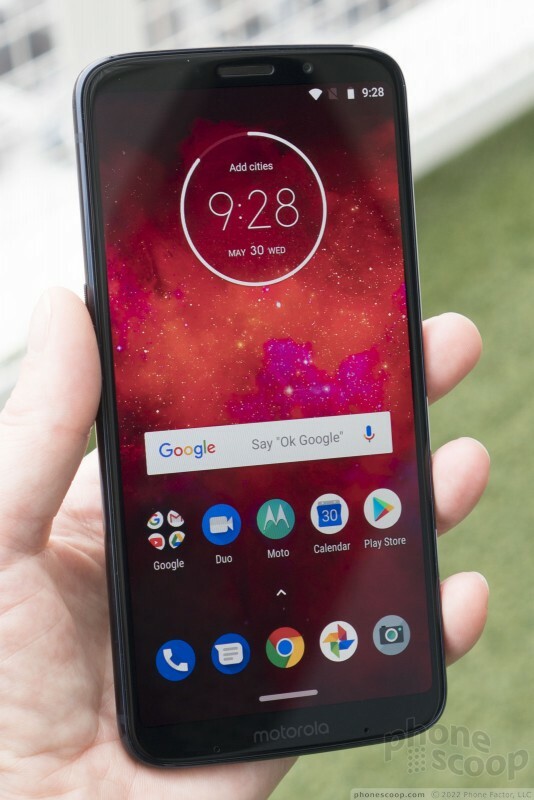 The Moto Z3 Play is a nice step forward for Motorola, which sees the company updating its mid-range device with modern features. 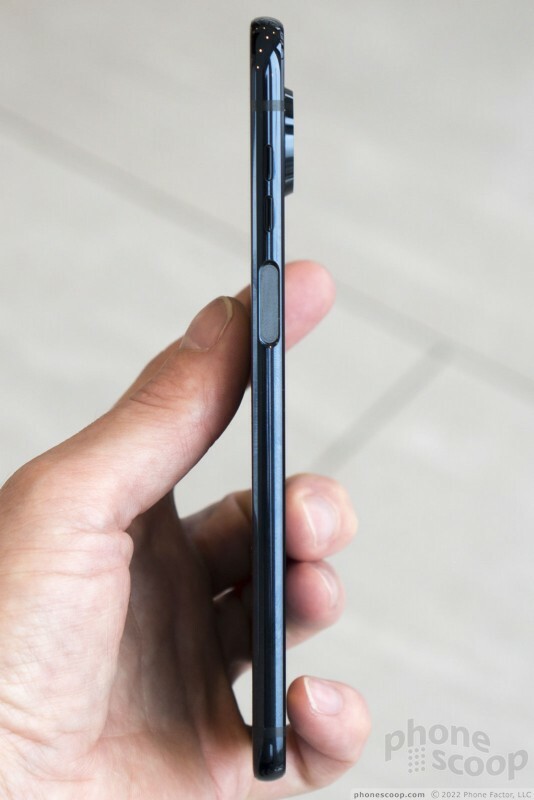 The Z3 Play keeps the general size and shape of previous Z phones, but drops the aluminum rear panel for Gorilla Glass. Together with the 6000 series aluminum frame, the Z3 Play is an attractive addition to Motorola's lineup. 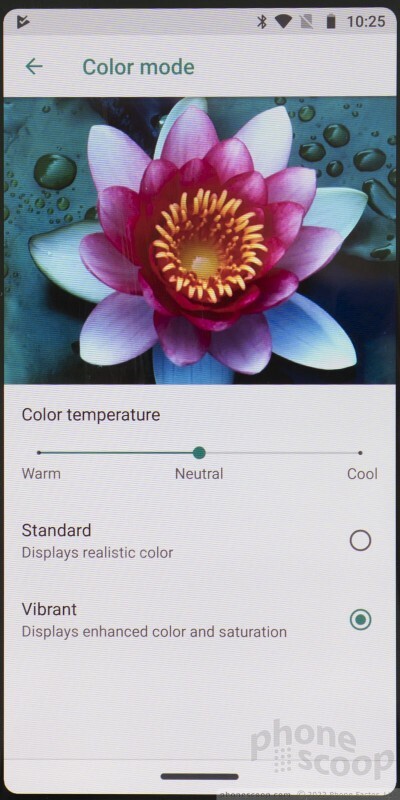 Motorola says the only color option is indigo blue. It's such a deep blue that it often looks black. The blue color only truly shows itself under bright light. I like the overall look and effect of the phone, which is handsome and sleek. The biggest upgrade for the device is the screen. 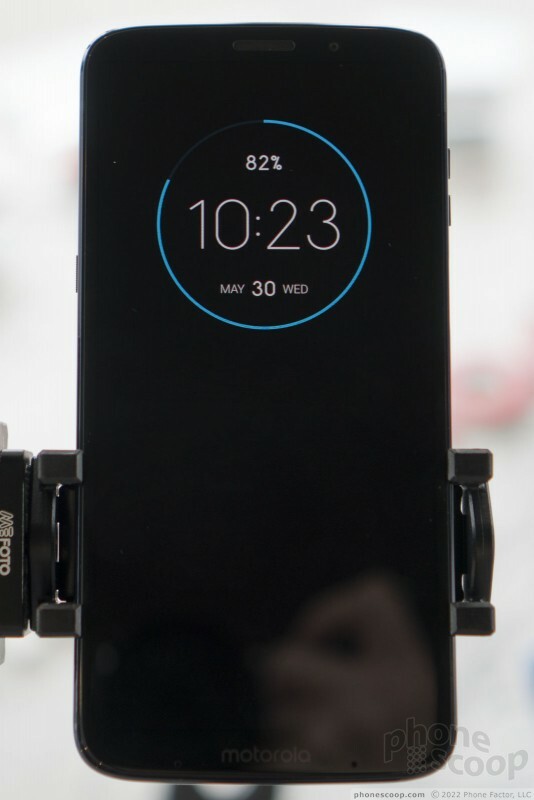 The Z3 Play jumps from the 5.5-inch 16:9 display of last year's Z2 Play for a 6.01-inch 18:9 display — all while keeping the chassis the same size and shape. This means a huge reduction in the forehead and chin, giving the phone a screen-to-body ration of 79%. This puts it more in line with competing phones. 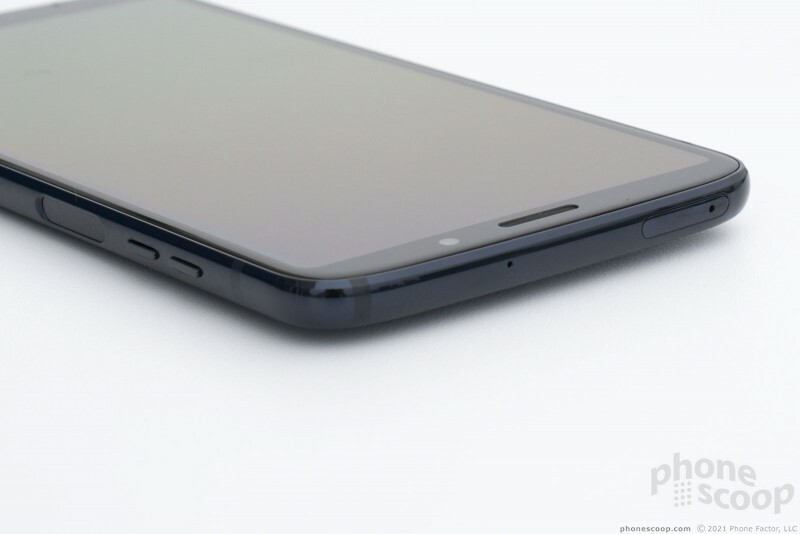 The screen is an AMOLED panel will full HD+ resolution. In the time we spent with it, it impressed. It pumped out lots of light and was easy to view outdoors under a bright sky. The resolution works well and everything on the screen was nice and sharp. Despite the AMOLED display, the phone is not compatible with Google's DayDream AR service due to the processor. That's a shame. 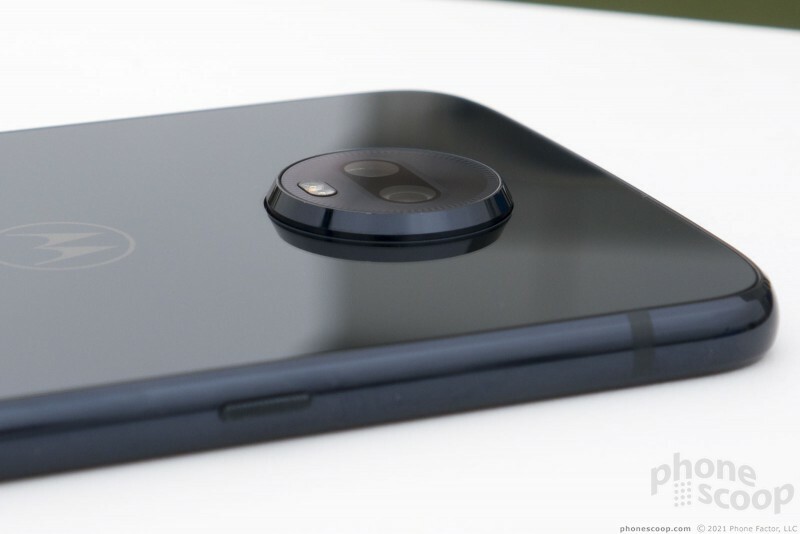 In order to retain the phone's footprint while increasing the screen size, Motorola was forced to relocate the fingerprint reader. The reader has long been stuck on the chin of Motorola's Z-branded phones. 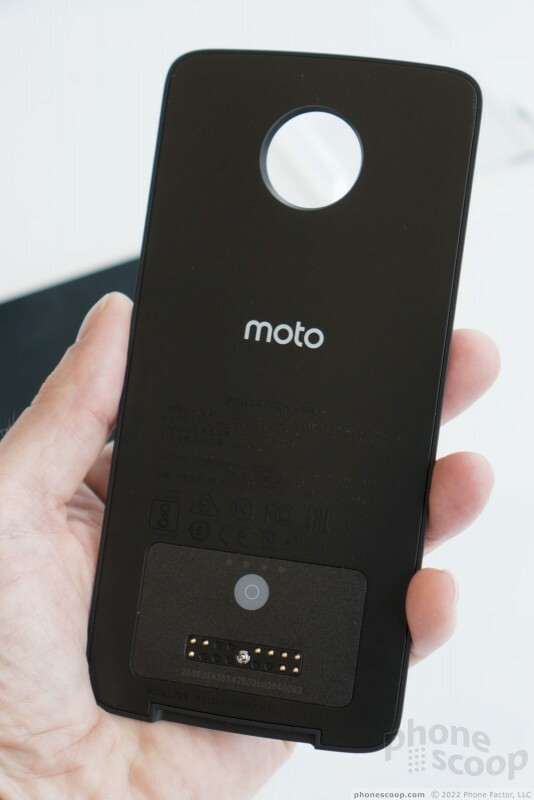 The reader can't go on the rear where it could be obscured by Moto Mods, so Motorola opted to stick the fingerprint reader on the right edge of the Z3 Play. We've seen this placement before on some phones from Sony. It works well enough after a brief adjustment period. The reader is recessed in the side of the Z3 Play and was easy to find and use. The phone is a high-quality piece of hardware. The glass panels fit into the frame tightly. It is still large at more than 6 inches tall and more than 3 inches wide, but it's incredibly slim at just 6.75mm. I have no doubt that some people will be put off by the size of the phone, but it's about the same size as most other phones with 18:9 screens. 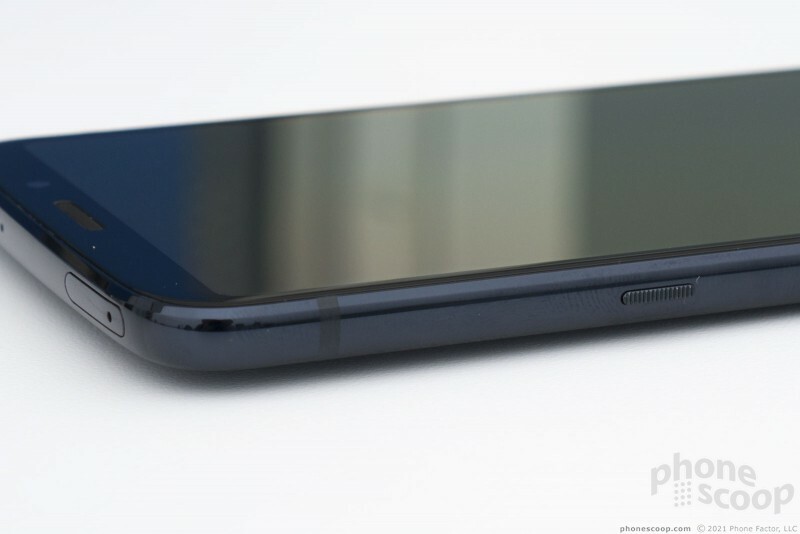 The thin profile and slippery glass means it slips into pockets easily. Physical controls around the frame are easy to find and use. 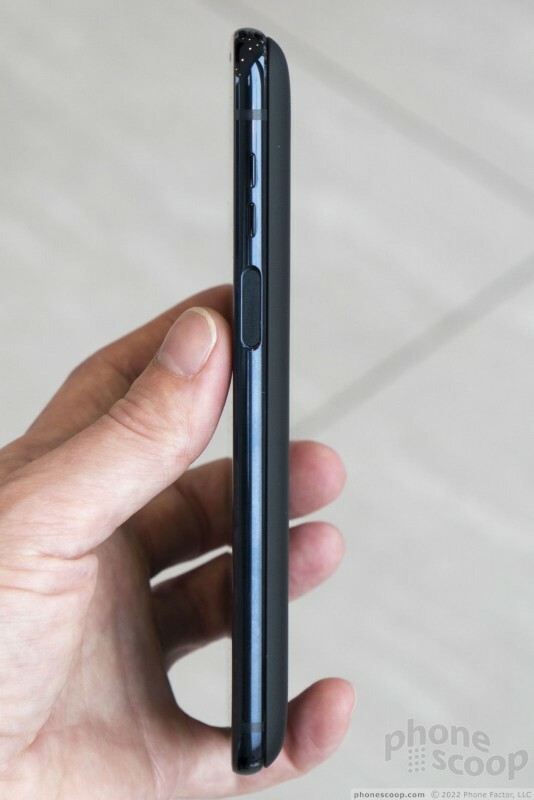 The screen lock button, which has a textured surface, is perched on the left side of the device. It has great travel and feedback. 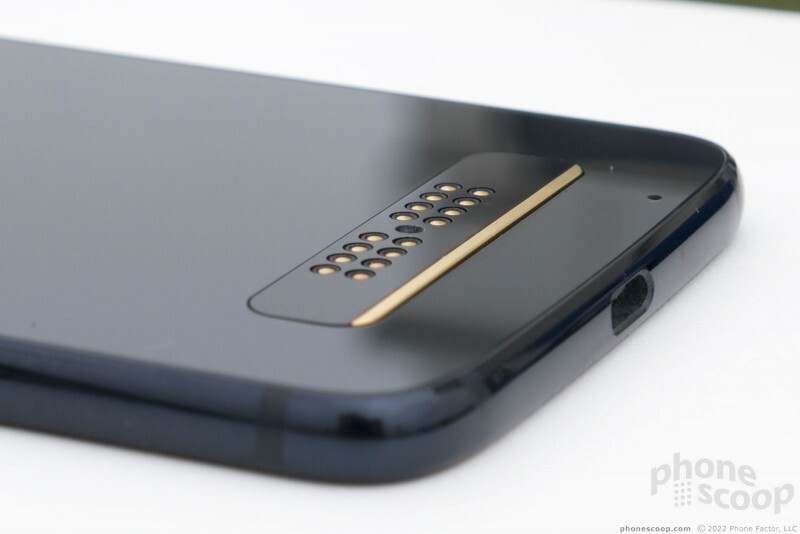 Motorola opted for two separate volume keys, which are located above the fingerprint reader on the right edge. These keys have smooth surfaces, but excellent profiles. Feedback is satisfying. 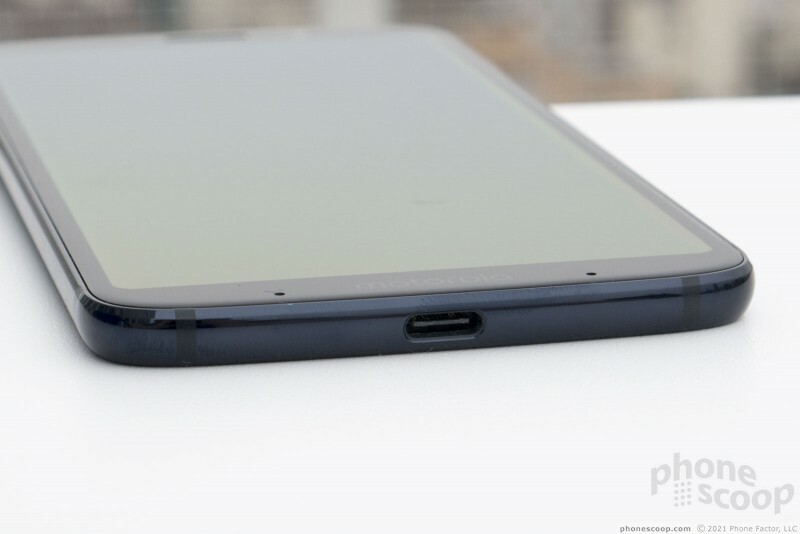 The USB-C port is on the bottom. There is no 3.5mm headphone jack (boo), but Motorola says the phone will ship with a USB-C-to-3.5mm adapter. The tray for SIM/memory cards is on the top edge. 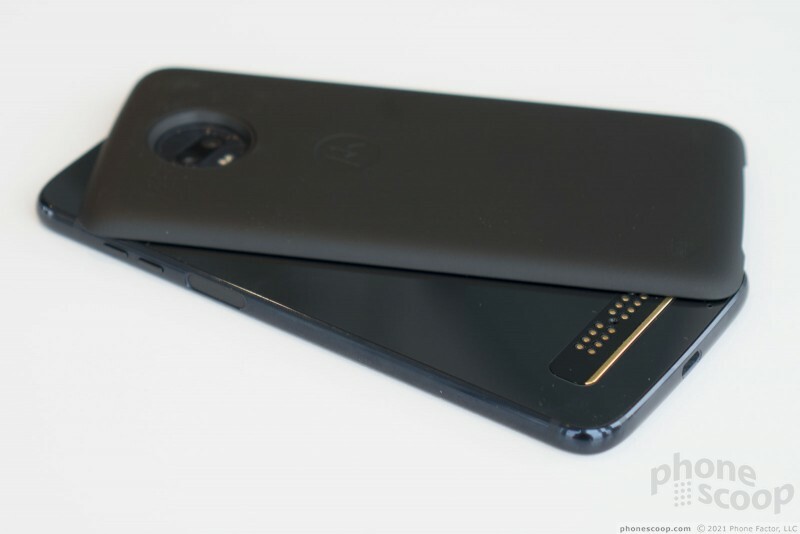 The rear surface its typical for a Moto Mod-compatible device form Motorola. The glass panel is perfectly flat save for the huge camera module. the module is about the size of two quarters stacked on top of one another. It has a reflective rim that sets it apart visually, if the size/shape didn't call it out enough. The copper-colored pins and magnet for the Mod system are near the bottom edge. 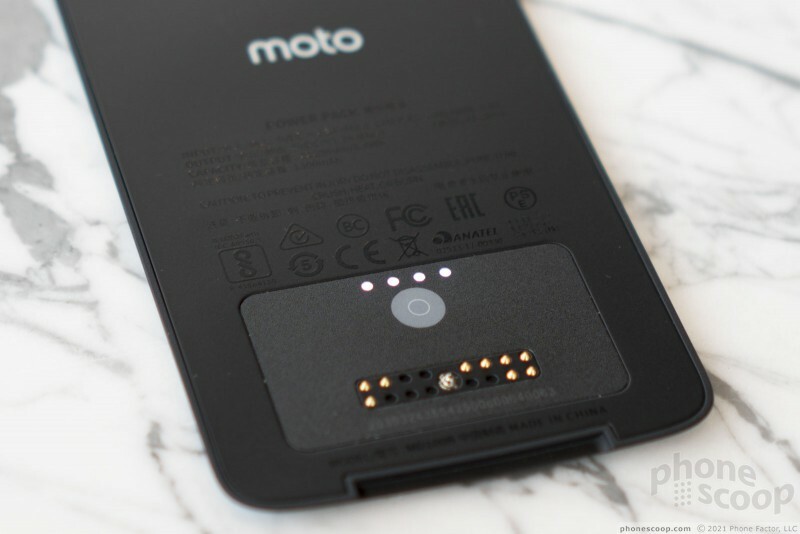 As always, these are what allow Moto Mods to attach to and connect with the Z3 Play. 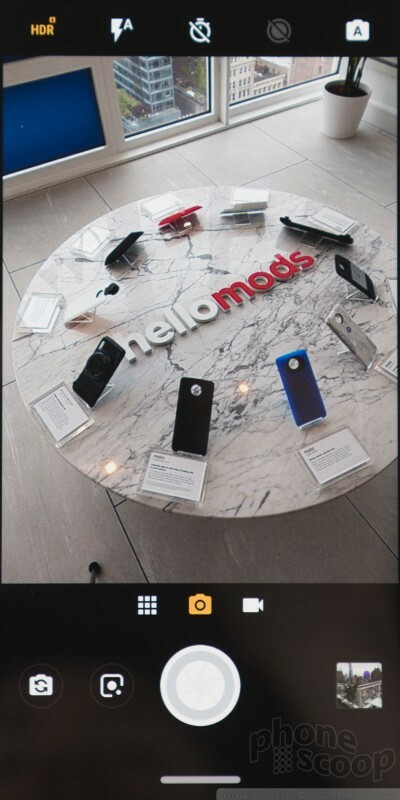 It's a great system that Motorola did a fine job engineering when it debuted two years ago. 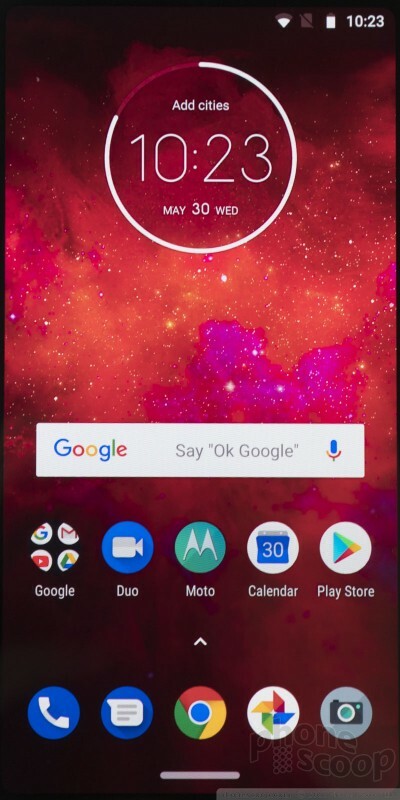 The phone runs Android 8 Oreo with Motorola's tasteful and helpful additions. 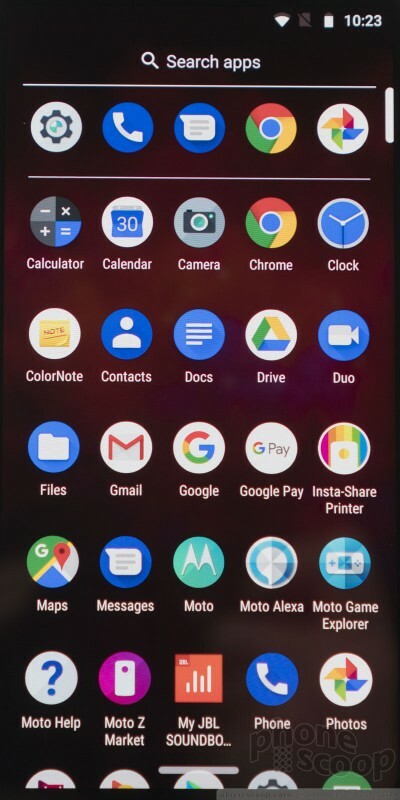 That starts with the Moto App, which controls Moto Actions, Moto Display, and other features that make using the phone easier day in and day out. New on the Moto Z3 is a swiping navigation user interface. 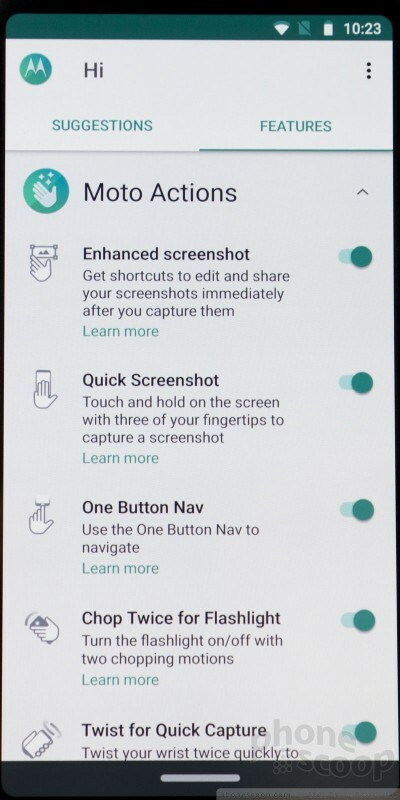 It sort of resembles what we'll see on Android P later this year. 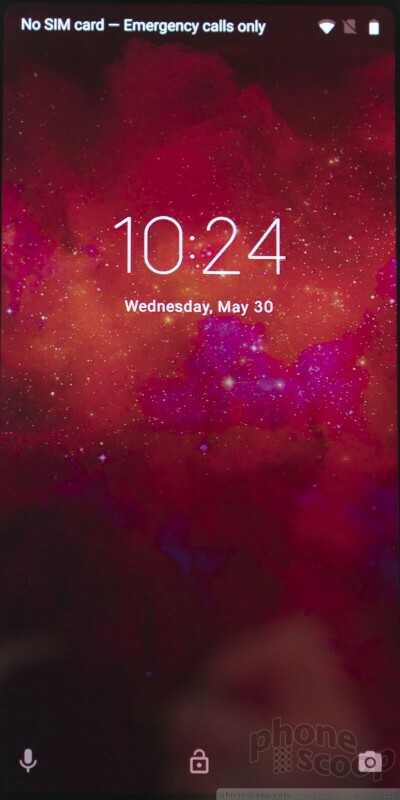 Taping or swiping the very bottom of the screen brings you to the home screen. Swipe to the right to jump to the multitasking screen and swipe to the left to go back a screen. These will probably take some getting use to. OnePlus has a slightly different system for its OnePlus 6 phone. The camera setup should make people happy, as it adds most of the features expected from modern devices. 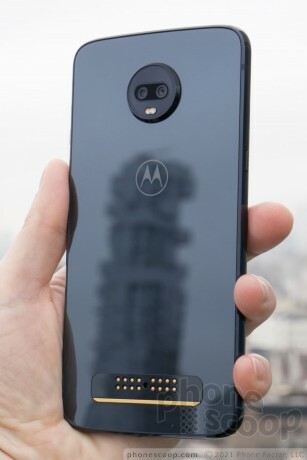 Motorola opted for a dual-camera array on the rear with a dual-LED flash. The main camera has a 12-megapixel sensor at f/1.7 and it is accompanied by a 5-megapixel depth-sensing camera. This system supports features such as portrait/bokeh, spot color, cinemagraphs, cut-out mode, panorama, time-lapse, slow-motion, face filters, and a card/QR code reader. 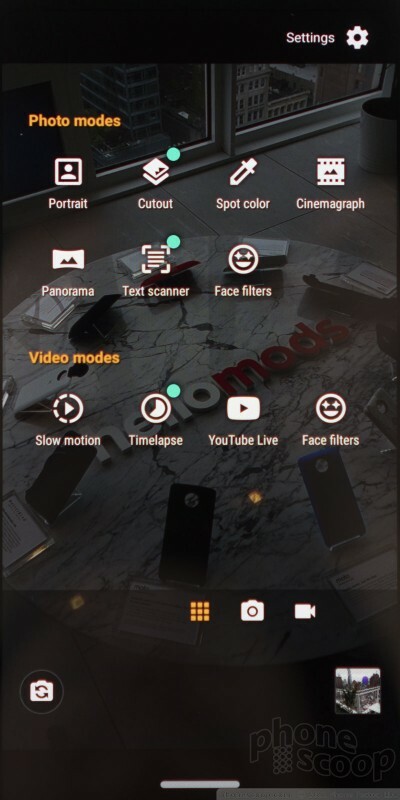 We briefly tested the cinemagraph mode and found it was fun and simply to use. 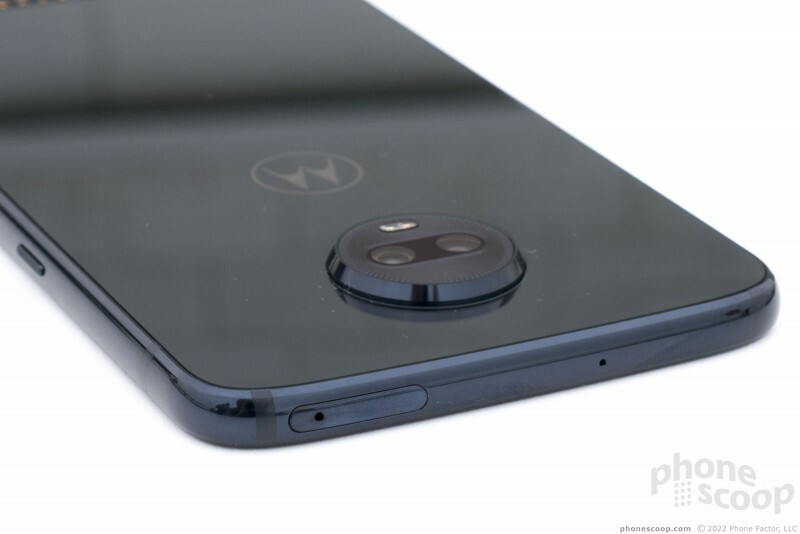 This is likely to be the biggest marketing point for the camera from Motorola, even though we've seen this feature on other phones in the past. 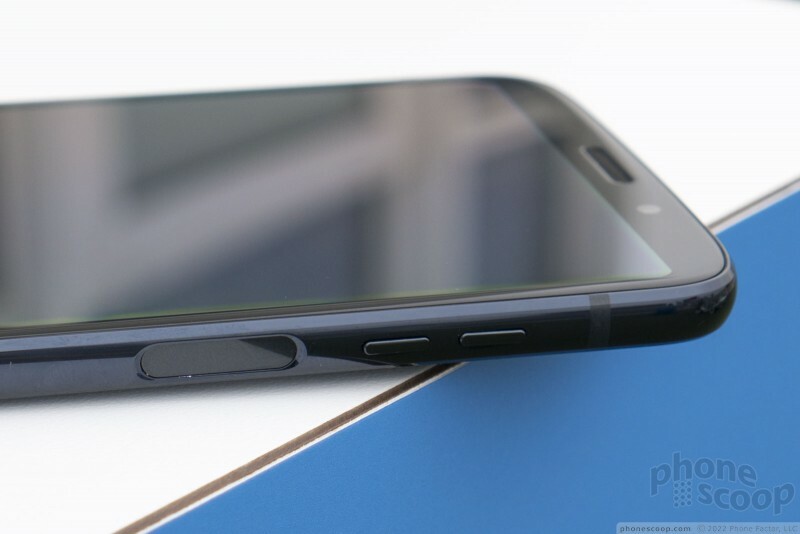 The front camera has a semi-wide-angle, 8-megapixel sensor at f/2 with screen-based flash. It carries over most of the features found on the main camera, including portraiture and cinemagraph. The phone is powered by a Snapdragon 636 processor and comes with 3/4 GB of RAM and 32/64GB of storage. 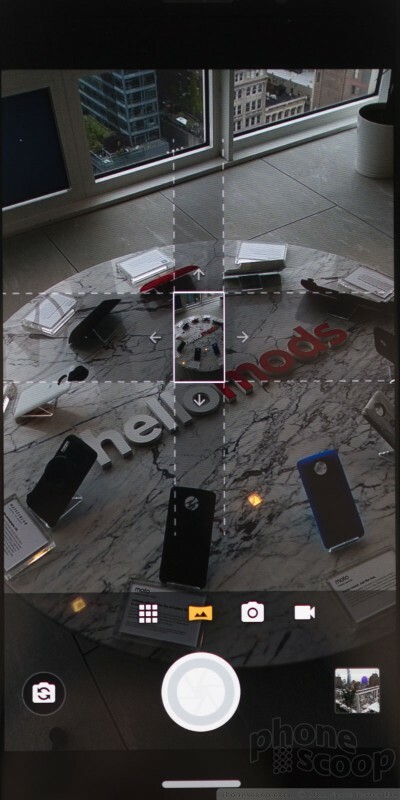 The phones we tested on site felt quick enough, even when using the advanced camera features. Motorola's distribution channels for the phone are rather interesting. The phone will be sold by Sprint and U.S. Cellular (notability, it won't be sold by Verizon, Motorola's long-time distribution parter.) The carriers will sell the phone by itself at an unknown price point. Motorola is also selling the phone unlocked via Amazon, Best Buy, B&H, Fry's, Newegg, and Walmart. The unlocked version will be sold in bundles for $499. One bundle includes the phone and a battery Mod, while the other will be sold with the phone and a speaker Mod. Preorders start June 21 an availability is June 29. We look forward to reviewing the phone in full in the weeks ahead. 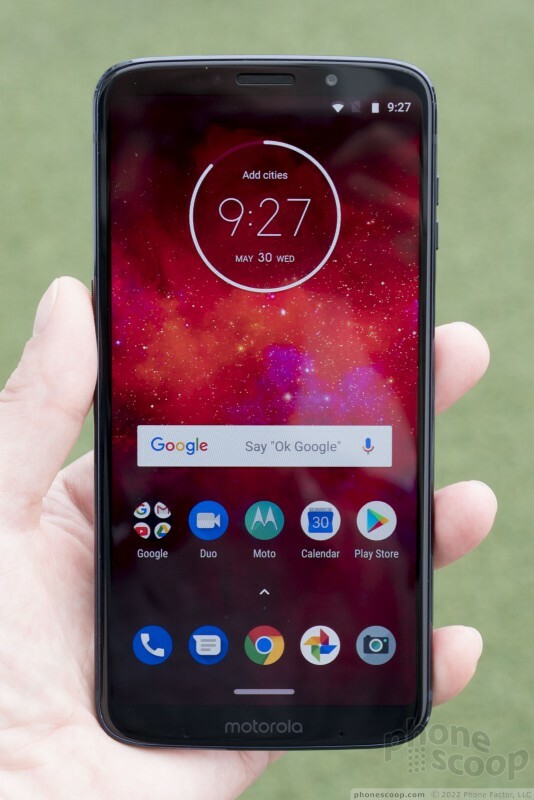 Verizon Wireless today added the Motorola Moto Z3 Play to its list of certified devices. This means the Z3 Play was tested by Verizon in its labs and passed Verizon's network performance requirements.